Frank Hartung manufactures primarily one-off electric guitars that are crafted in close cooperation with the customer. Thus, the guitarist’s preferences and desires are combined in a unique instrument. First class selected materials are paired with innovations and the highest artisan expertise in Frank’s workshop in the Thuringian town Langewiesen, to build unmistakable guitars with the utmost attention to detail. His guitars are sold worldwide and enjoy an excellent international reputation. They can be found in select boutique stores in many countries of the world. 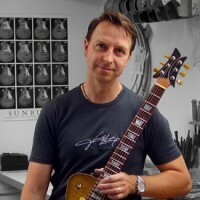 In 2014, Frank Hartung won 1st prize of the German Music Instrument Award of the Federal Ministry of Economy and Energy in the category “electric guitars”. I am a qualified carpenter, trained from the very ground up in handling the material wood. The love for music was the driving force that led me to playing the guitar someday. From there I gained increasingly interest in woods, contructional details, hardware and the way these components intertwine in a guitar. Finally I built my first guitar and it was quite well done. From my perspective as a craftsman, I love what I do and like the challenge to take a couple of raw materials and to build something that I consider perfect.